Dingtone the new way to talk, text and share, for free! 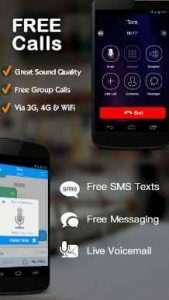 Dingtone allows you to make unlimited free phone calls, send free text messages to any phone number. Calls and texts between Dingtone users are entirely free. The Dingtone app also gives you 2nd line, a real phone number for calling and SMS messaging. Turn your phone into a Walkie Talkie. Push to talk! Dingtone lets you make unlimited free internet calls to anyone over WiFi, 3G/4G data network without using any cell minutes; Invite you family members and friends to use the free phone call app for free internet calling and free SMS, and start saving money now. A FREE U.S. phone number that works! Voice calls are transmitted on Dingtone’s high-quality dedicated VoIP network. With HD voice technologies, most free online calls between Dingtone users have superior clarity to existing regular phone service. Free calls and cheap calls are no longer cheap quality! Free SMS is lightning fast on our network. Tired of typing text messages on the small screen? Dingtone transforms your phone into a real Walkie Talkie – simply push a button and speak. It works like a two way radio! Push to talk and voicemail are perfectly tied into one clean interface. Dear user, thank you for your approval. We will make Ding tone better. Helps me when i cant afford my phone bill. The free credits only come in hald the time. I probably have ober 200 pending credits that i haven’t recieved. Other than that this app helps me a lot.